The Rev. Noe Lara, Iglesias Cristians Ebenezer; the Rev. Paul Slack, New Creation Church; Fr. Doug Ebert, Guardian Angels Catholic Church; Bishop Ann Svennungsen, Minneapolis Area Synod ELCA; the Rev. 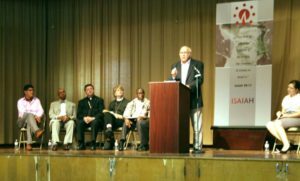 Dr. Francis Tabla, president of Liberian Ministers Association; and Bishop Lee Piché, Archdiocese of St. Paul and Minneapolis offer their support for comprehensive immigration reform at a rally at Guardian Angels in Chaska, Minnesota. 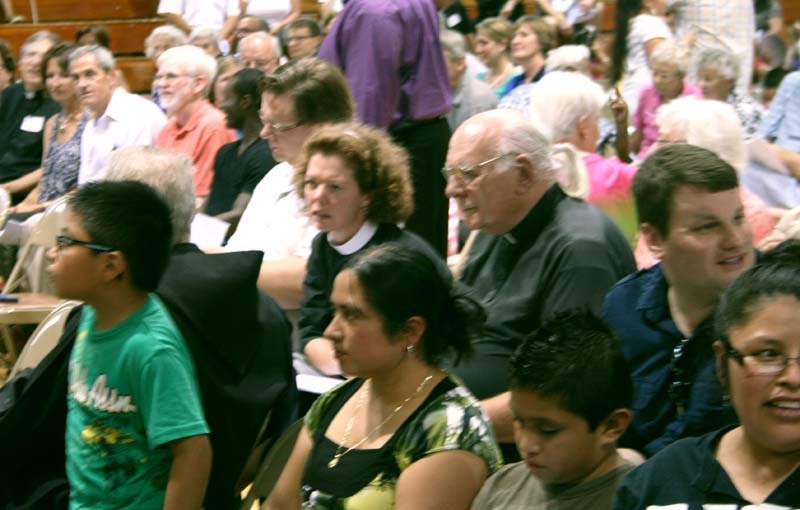 More than 400 clergy and lay congregational leaders braved 90+ temperatures August 24 to rally in the Guardian Angels Parish School gymnasium in Chaska, Minnesota, in support of comprehensive immigration reform and a path to citizenship for immigrants. Minneapolis Area Synod (ELCA) Bishop Ann Svennungsen and Auxiliary Bishop Lee Piché of the Archdiocese of St. Paul and Minneapolis were among civic and religious leaders extolling participants to pray for resolution of the federal legislative impasse and to share their message with Rep. Erik Paulsen (Minn.-3), who represents Chaska and most of the southwestern suburbs of the Twin Cities. The House of Representatives failed to consider comprehensive immigration reform before going on its traditional recess in August. A major immigration reform bill will be one of the first items on the agenda when Congress reconvenes in September, and across the country, Members of Congress are using the break to meet with constituents in order to gauge interest in the upcoming legislation. 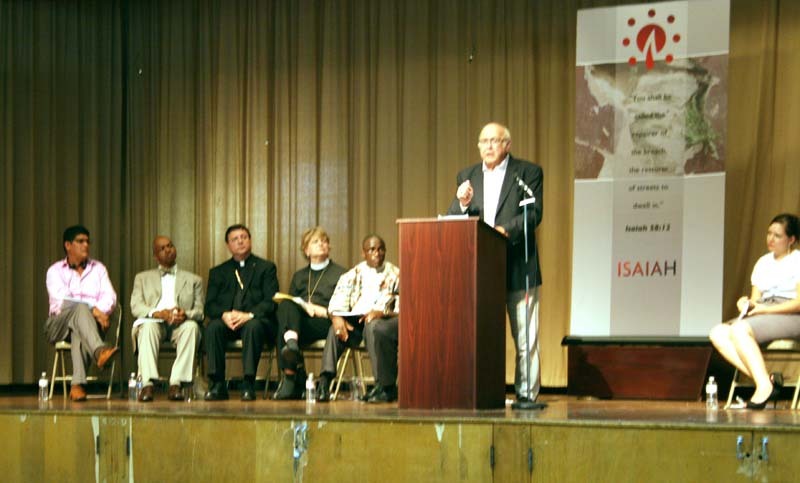 “By coming together in prayer, we are making the most powerful statement that people of faith can make, lifting up our struggles to God; trusting in God’s protection for families who are facing separation,” Svennungsen told a crowd made up primarily of members of ISAIAH, a faith-based community organization comprised of almost 100 congregations in the Twin Cities and St. Cloud. . “We are sending a message today that the faith community stands with immigrant Americans. Former Chaska Mayor Bob Roepke encourages supporters of immigration reform to help rebuild the web of community as they work for a path to citizenship. “We are asking our political leaders to stand with them too and to publicly support a pathway to citizenship that is fair, direct, and inclusive of all our brothers and sisters who aspire to become citizens in the country they love,” Svennungsen said. Carver County Commissioner Randy Maluchnik emotionally recounted that his Polish grandparents were not considered criminals when they immigrated to the United States. He believes that the 11 million currently undocumented immigrants need a similar path to citizenship, and not simply for reasons of justice. “The cost to the federal and state and local taxpayer is much too high,” he explained. “We must have a commonsense immigration policy, … because doing so means being fiscally responsible.” Maluchnik recounted the many costs for local governments of the current immigration system. A large diverse crowd expressed their desire to have Rep. Erik Paulsen's support on comprehensive reform as Congress returns to session. Former Chaska Mayor Bob Roepke remembered “I grew up in a town [Chaska] that had a value for everyone, a value for the community – the brightest and best, as well as those with challenges.” He argued that Chaska should still be that way today, welcoming its newest immigrants as full members of the community. ISAIAH is in the process of gathering 10,000 signatures from members of faith communities to present to Paulsen. Organizational leaders announced that they are willing to talk about comprehensive immigration reform in any interested congregations. 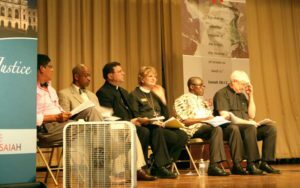 Tags: Bishop Ann Svennungsen, Bishop Lee Piche, Bob Hulteen, Bob Roepke, comprehensive immigration reform, Congress, Cross of Glory Lutheran Church Brooklyn Center, Crown of Glory Lutheran Church Chaska, Doug Mork, Gretchen Pierskala, ISAIAH, Randy Maluchnik, Rep. Erik Paulsen, Rev. Ann Svennungsen, Rev. Doug Mork, Rev. Martin Luther King Jr.